Having rather foolishly double booked myself during the last Whisky Lounge event in London (a Springbank tasting that I was rather looking forward to that got dropped in favour of an evening of sherry) I grabbed a ticket to Mr Ludlow’s December extravaganza as soon as I could. 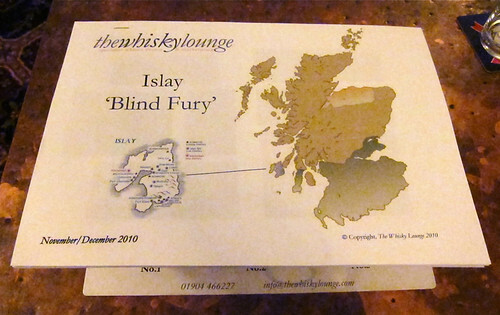 This time the format was slightly different in that it was to be a blind tasting, with the whiskies revealed at the end of the night, focusing on whiskies from the whisky obsessed island of Islay. There are currently 8 distilleries on the island (with a 9th in the planning/building stages), which isn’t bad for a piece of land less than half the size of London and inhabited by only 3500 people. While traditionally Islay is known for its peaty spirit the distilleries produce a range of whiskies, with Bunnahabhain producing unpeated spirit (most of the time) and Ardbeg producing face melting bottles of smoky mud (also, most of the time). A blind tasting of these is quite interesting, as while each distillery has its own style different bottlings borrow ideas from the other producers, making things all a bit muddled. There are a few bottlings and distilleries that I reckon I could pick out, but I was interested to see how many I could guess. In the end though this blind tasting wasn’t about guessing. Knowing where the spirit in my glass has come from will often prompt an attitude or tasting note that comes from inside my head rather than from the glass. Tasting blind removes all of that and hopefully lets us taste without preconceptions. 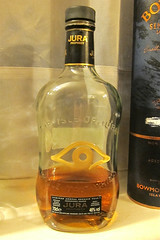 First up was a coppery bronze dram that Eddie let us know was between 46 and 50% alcohol. On the nose it was sweaty and muddy, with camphor, apple, sea salt, a hint of oranges and salted caramel. 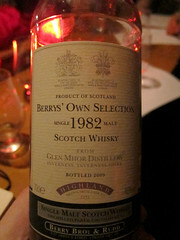 To taste it had vanilla and light smokiness (more woody than peaty), with a syrupy texture and a dry, spicy wood finish. Water brought out more sweet creamy vanilla and some perfume from the wood, as well as some sticky glacé cherry. The tasting note we ended up providing was ‘Soggy marmite toast with salted butter and golden syrup, all spread with the same knife’, although Chris’s ‘Birkenstock sandals that someone else has been wearing all summer’ as one for just the nose almost pipped it. As an overall description his note of ‘A speyside whisky on holiday’ pretty much nailed it – not your usual Islay fair. My prediction for this one was that it was a sherried Bunnahabhain and I was rather pleased to see that I was right – it was Bunnahabhain 12 years old. This is a new version of their standard whisky, bottled at a stronger than before 46.3% and made up of a mix of bourbon and sherry casks. Totally unpeated and quite rich, it was a tasty start to the evening. 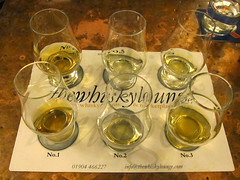 Next was a very lightly coloured whisky which we were told was between 50 and 55%. On the nose it was quite a big difference to the previous whisky – woody/muddy peat, mulchy seaweed, mint, mushrooms, pears, strawberry, cracked granite, meaty butter, a hint of the farmyard and a floral centre (maybe roses). To taste it maintained the muddiness from the nose adding in some piney smoke. It had a minerally, grassy finish that lingered around with a hint of the sweetly syrupy middle flavour. Water tamed it nicely, adding orange, lime and a generic ‘fruitiness’ to the nose, pushing the smokiness back a bit. This revealed more stoniness and some sweet citrus hanging around in the middle. I didn’t have much of a clue on this one and put it down as maybe one of the peaty Bruichladdichs, focusing on the mineraliness. 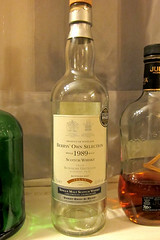 As expected I was entirely wrong – it was a Berry Brothers and Rudd 1989 Bowmore, bottled at 50.9% and 20 years old. Probably from a quite inactive cask and totally unlike any Bowmore I’ve tried before. Next up was a coppery dram that we were told was between 55 and 60%. On the nose there was turkish delight, dark chocolate, raisins, burned apple pie (very specifically listed by me as the burned bits on the top of the pie where the pastry cracks and the filling bubbles out, and by someone else as the layer between the filling and the pastry when the top has burned), bread and butter pudding, and a bed of meaty peat under it all. To taste it was very smoky, with a heavy coal smoke flavour almost obscuring vanilla and more apple pie. Water helped separate the flavours, leaving a spike of peat at the front leading to a sweet muddy mulch. The coal is calmed down to reveal vodka-like grain. Our note for this was ‘Apple pie and ice cream beside an iron coal stove’. 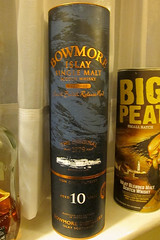 This was the first whisky I was fairly certain of, writing down a definite Bowmore – the specific sweet smokiness is the flavour that I find in Bowmore and few other Islay whiskies, and this time I was right – Bowmore Tempest, a 10 year old whisky bottled at 56%. This one was from the second batch they’ve made of this and was matured in first fill bourbon casks. Our penultimate dram was very light and between 46 and 49%. From the nose I was certain I knew which distillery it was from – a strong smell of the farmyard, light alcohols, white cabbage, menthol, caraway, vodka, a light oiliness (the smell of ‘flavourless’ cooking oils) and white pepper. It smelled young and was quite thin and prickly. To taste it had a creaminess combined with the smoke, bringing to mind Bavarian smoked cheese tubes. It also had sweet root vegetables, lots of caraway and a pleasantly creamy mouth feel. A drop of water brought out tropical fruit, sour wood and mulchy peat as well as more cream. I was certain that this was Kilchoman, the island’s newest distillery, as the whisky tasted very young and similar to the new make spirit and not-mature-yet ‘whiskies’ that I’ve had from them. 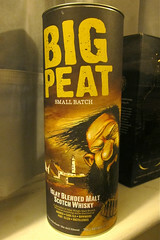 Yet again I was wrong – it was Douglas Laing’s Big Peat Batch 10, a blended malt bottled at 46% and made up of whiskies from Ardbeg, Caol Ila, Bowmore and Port Ellen (although as the latter is closed and bottles go for silly amounts of money we assumed that there wasn’t much of it in there). This is a really young tasting whisky and ones that makes me want to crack open the bottle of Kilchoman I have hiding at the back of my cupboard. The last whisky of the night was a pale gold, and between 55 and 60%. On the nose it had golden syrup and salt, burning grassland, mint, white grapes and a stony minerality. To taste it was sweet with and almost cloying peatiness backed up by wood smoke. There was also sweet fruit (apple and strawberry? ), fragrant tea and pepper. Water brought out lime and vanilla on the nose, and sherbert, wet carpet, cinnamon, lemon & lime, spiced orange peel and a tarry finish to the taste. Again, I was fairly certain I knew what this one was (especially bolstered by 6 drams as I was by this time) and both wrote down and called out Laphroaig Quarter Cask, focusing on the sweet peatiness and minerality that I find in that whisky. Predictably I was wrong again – it was a cask sample from Ardbeg. Drawn from the cask (a first fill bourbon barrel) quite recently it was at the cask strength of 56.3% and was distilled in 2000. At the end of the tasting we all scored the whiskies out of 100 (something that I hate doing, hence the lack of scores on this site) and Eddie is now collating the results from all of the tastings ready for release to see which whisky came out top overall. My favourite of the night was the Berry Brother’s Bowmore, followed by the Big Peat, so I’ll be interested to see what the group reckoned. Single Malt Islay Scotch Whisky, 46.3%. ~£30 from The Whisky Exchange. Single Cask Single Malt Islay Scotch Whisky, 50.9%. ~£60 from BBR. Single Malt Jura Scotch Whisky, 46%. ~£50 from Master of Malt. Single Malt Islay Scotch Whisky, 56%. ~£40 from Master of Malt. Blended Malt Islay Scotch Whisky, 46%. ~£30 from Master of Malt. Single Cask Single Malt Islay Scotch Whisky, 56.3%. Not available unless you go to the distillery and beg or rob Eddie. Another month, another slab of Whisky Squad related delight Chez Jeff, the lovely landlord of The Gunmakers. This month we were treated to another special guest following in the rather hefty footsteps of Colin Dunn – Rob Whitehead from Berry Brothers & Rudd. Regular Whisky Guy Darren was off recovering from a whisky related sojourn state-side, so we were left in the capable hands of Rob to run us through some of the whiskies that Berry Brothers bottle. Berry Brothers & Rudd are the oldest family owned wine and spirit merchant in the world. Generally they’ve been known in more recent times for their wine, with their cellars extending for quite a way under St James’s, but they are also a very well respected independent bottler of spirits. Despite having known about them for a while, something that is inevitable when your dad sells wine, I didn’t realise that they also did whisky until recently. 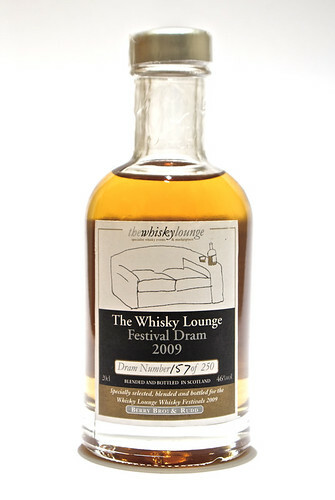 Having tried a couple of drams at whisky live earlier this year I did a bit of research and found that they’d won Whisky Magazine’s Independent Bottler of the Year award last year, a feat they’ve recently repeated for a second time. The shop started out in 1698 as grocers on the same site that it is now, 3 St James’s Street. The Berry clan became part of the business in the 1780s through marriage and Hugh Rudd joined the company in 1914 as a junior partner, completing its current name. While the wine side of things is more well known these days, with the full cellars of St James’s as well as a warehouse in Basingstoke allowing them to store 6 million bottles of wine, a million of which are looked after for customers needing proper cellaring, it was whisky that helped them keep going through the post-war period. In 1923 they released Cutty Sark, their own blend, which had great success in the US during the 50s and 60s giving a well needed boost in the still struggling British economic climate. They recently did a trade with the Edrington Group, swapping Cutty Sark for Glenrothes (which they already had a part share in) and a share in the Anchor brewery in San Francisco, but the whisky loving streak runs deep in the company. Rob works with the BBR spirit’s manager Doug McIvor to put together an impressive selection of spirits, from distillery bottlings to a range of their own – the Berry’s Own Selection. This doesn’t only cover whisky, but also rums, and they also bottle their own cognacs and gin – the spirits room at their shop is rather full of interesting looking bottles. However, the whisky is where we were at for the evening. They bottle quite a range, with their youngest being a 4 year old Ledaig and the oldest a 42 year old Carsebridge, from all over Scotland. They buy casks from various distillers and mature them in a variety of locations, having their own warehouse in Scotland as well as leaving many with the distillers themselves, although in order for a whisky to be called scotch it does have to be matured in Scotland. 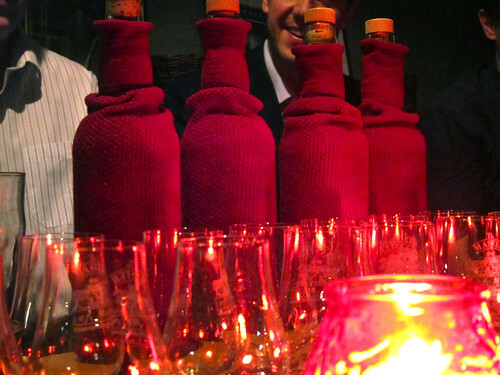 Their bottling policy is very simple – it’s bottled when it’s at what Doug thinks is the whisky’s best. If they miss that point or if they don’t think it will reach it they sell the cask on – the trade in casks is very active, with many companies needing whisky for blending and not worrying if it’s not up to single cask bottling as it will only be one component of many in a finished product. In traditional Whisky Squad style we tried the whiskies blind, with Rob helping this along by bringing along a set of whisky socks to conceal the bottles. 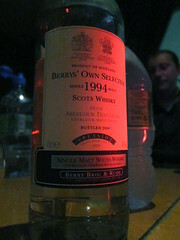 We started on what he described as ‘Breakfast Whisky’, a lightly coloured introduction to the evening. On the nose it had boiled sweets, liquid caramel and apples. To taste it had spice, orange candy, sherbert, polished wood and a hint of floral (rather than peppery) olive oil. Water brought out more of the woody flavours, with vanilla and sour wood joining the rest, along with blackjacks, menthol and a biscuity graininess. Guesses were made and Rob revealed the bottle to be a 14yr old Aberlour matured in a many times refilled cask. The standard Aberlour style is quite heavily sherried (as I’ve mentioned before), so this less active cask, as most of the wood flavour had been leeched out through the previous fillings, gave a more ‘naked’ tasting Aberlour, revealing the underlying new make more than usual. We moved on quickly to number 2, a rather different beast. On the nose it had rubber boots, earthy smoke, turpentine, chilli and charcoal, with a sweet hit at the back of the nose. My tasting notes start with ‘charcoal butter’, continuing with lemons, brine and a smoky mineral (granite?) finish. Water tamed things slightly, revealing a rich spicy sweetness and more of a prickly mouthfeel – maybe revealing a hint of horseradish. This one at first seemed easier to guess, being quite blatantly made in the style of an Islay whisky, and predictions were made. 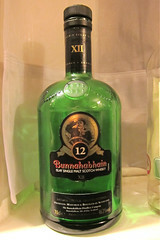 However, this was another deliberate curve ball – a 12 year old heavily peated Bunnahaibhain. The regular production bottlings of Bunnahabhain are unique on Islay due to being almost entirely unpeated, however for two weeks a year, just before they close down for summer, they distill a heavily peated spirit that is generally used in making Black Bottle (a smoky blend using a bit of most of the Islay malts). They then thoroughly clean out the stills and tuns before returning to their regular spirit production when the distilling starts up again. 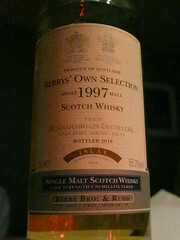 Berry’s bought some casks either side of the closedown one year and released this rare peated version – the others are still waiting to reach their peaks. Number 3 was my favourite of the night. On the nose it had flowers, wax, pears and linseed oil, along with a sweetness that I described at the time as ‘like when you mix together the strawberry and vanilla sections of Sainsbury’s neapolitan ice cream after it has started to melt. There’s not chocolate because the chocolate bit in neapolitan ice cream is rubbish’. I ate a lot of Sainsbury’s neapolitan ice cream as a child. To taste it had a big creamy sweetness with fizzy lemons, opal fruits, sour plums, and some oiliness and spicy dry wood. A drop of water opened it more with strawberries and custard, but it stilled retained the woody spiciness. An interesting dram that I dreaded discovering the price of. The sock was whipped off and it was shown to be a 26 year old Glen Mhor. This didn’t enlighten me much, but Rob continued with the story. Glen Mhor (pronounced ‘Vor’) was an undistinguished distillery in Inverness, not particularly admired but producing okay whisky until it closed in 1983. It was demolished in 1986 and is now a Co-op. This cask was distilled in 1982, just before the closure, and bottled in 2009, and unlike the regular whisky the distillery produced it has come out to be rather special. It’s an older style of whisky, as you might expect from a slowing down distillery in the early 80s, and Rob told us about whisky lovers who tried things back in the early 80s waxing lyrical about its old school flavour. The writing of this post was accompanied by a dram of it. Number 4, the ‘official’ last whisky of the tasting, was poured out and sat a deep bronze in the glass. On the nose it had sweet orange, dark rum, vanilla and coconut. ‘Like a milk chocolate Bounty’ someone offered from the room. To taste it had a cool creamy sweetness with a touch of woodiness and a drying finish. Water brought out more flavours, with butter icing and sour fruit making an appearance. The finish was still woody, with some astringent booziness to the sides of the tongue. 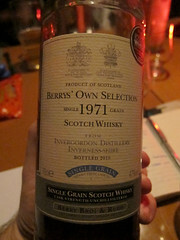 While the guessing went on I rather proudly detected the key USP of this whisky – it’s a single grain. With my recent discovery of and continued searching for grain whiskies I shouldn’t be quite so preening, but preen I did. The sock was removed and it was shown to be a 39 year old Invergordon single grain. I tried one of their previous bottlings of Invergordon at Whisky Live when I first discovered the Berry’s Own Selection range and thought it was quite special – this one beat it hands down. Distilled in 1971 this was bottled 5 weeks ago, with an outturn of about 190 bottles, missing out on its 40th birthday by a few months. After 39 years it still came in at a strength of 47%, which was helped along by the cask being filled with much higher alcohol distillate than usual – maybe 70% or above. The empty barrel has since been filled with Laphroaig new spirit and is now sitting somewhere thinking about what it’s done, waiting to be bottled some time in the future. This whisky reminded me of the Port Dundas that I own as well as the one that Colin Dunn brought along to Whisky Squad #5 even though this was matured in a first fill bourbon cask rather than sherry, as used in the other two. An interesting whisky that shows the delicate common characteristics of well aged grain and one that I was very tempted by. 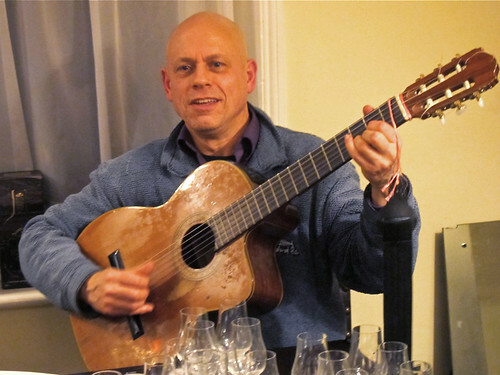 Now that the tasting had officially finished Rob unveiled a special fifth bottle. Grabbed on the way out of the shop it’s one that was used for customer tastings of a whisky that sold out that day. Rather than leave it hidden in a cupboard Rob kindly brought it along for us to have a try. On the nose it was waxy with linseed oil, sherbert and thick vanilla. To taste it started with leather and stones before moving to a floral sweetness with red fruit and citrus, and a dry woody finish. Watter brought a chalkiness with the fruitiness, described as ‘fruit rennies’, sherry wood and more vanilla. Rob gave us a few hints, starting with the fact that the distillery is now closed. It’s a triple distilled (rather than the more regular double) lowland whisky that was matured in a fourth fill sherry cask. With blank faces all around the sock was removed for one last time to reveal a 26 year old St Magdalene from 1982. The distillery closed in 1983, another victim of the over production of the 70s, and is now a block of flats. This bottling sold for £90 and is now completely sold out. We repaired, as usual, downstairs to find the place had been overrun by the London Perl Mongers on their monthly meetup. Being an occasional monger of Perl I knew a bunch of people and they soon started digging in to the left over whiskies that made it behind the bar – the Invergordon didn’t last long. I ended up running down to Berry’s the next evening to grab a bottle of the Glen Mhor (one of the last 5 or 6) and caught them just before they closed. I’m not sure if it counts as a lock-in but Rob walked me through a couple of their other whiskies including the fabled 4 year old Ledaig, the youngest they’ve bottled and also completely sold out, which was a young peaty slap to face (and good with it), and also their Guyanan demerera rum, which was dark, dangerous tasting and unlike any other rum I’ve tried before. It’s definitely worth the trip down to St James’s. 14 year old speyside single malt scotch whisky. 46%. ~£35. No longer available online. 12 year old cask strength Islay single malt scotch whisky. 55.3%. ~£45. No longer available online. 26 year old cask strength highland single malt scotch whisky. 46%. ~£70. No longer available online. 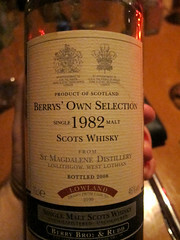 26 year old lowland single malt scotch whisky. 46%. ~£90. Sold out. There’s a chance that the whiskies that aren’t online are available at their St James’s Street shop, so it’s worth wandering in if you’re interested. While I feel slightly guilty for not writing up my notes from the floor of The Whisky Lounge London Show this year, what with this blog allegedly being the only reason I drink, I didn’t come away from the show empty handed. Along with the bottle of Greenore, as inspired by the Cooley tasting, I met Celine Tetu of Arran Distillers and Malcolm Waring of Old Pulteney, both of whom ran tastings that I went to recently, I bumped into Jason of the Whisky Squad, Dave of Londonist and Guy from Albannach, and I managed to grab a bottle of The Whisky Lounge Festival Dram 2009. The guy on the shop stand told me that it’s a combination of all of the whiskies that Eddie, the man behind Whisky Lounge, liked from last year’s Whisky Lounge events, vatted together by Berry Brothers and then bottled in this limited edition of 250 20cl bottles. If true, this means it’s a blend of Scottish, Irish, Japanese, American and Indian whiskies, which may make it the most cosmopolitan blend that I’ve tried before. On the nose there’s parma violets, fragrant wood, vanilla, oil, cinnamony spice and a light meatiness. To taste it’s generally sweet with apples, pears, a hint of mustardy burn, butter, linseed, sweet cream, dried fruit and a prickly sweet wood finish. Water brings out vanilla and biscuits, apple pie and victoria sponge with butter icing. The finish is slightly more bitter but with a touch of red fruit and drying vanilla wood that lingers for a while. A bit of a random dram, but one that I quite like, especially with the sponge cakeyness that water adds. A potential world spanning blended whisk(e)y. 46%. I think it was £12 for a 20cl bottle, but my memory is spotty. I suspect it’s sold out, but if you ask Eddie nicely he might have some bottles in his loft.